About this time every year, something attacks me other than pollen and seasonal allergies. I call it the travel bug. My symptom is an itch to go on a trip. Truthfully, I get the itch a lot, but it really comes on strong around Spring Break and Easter. Last year at this time, I was getting ready to pack my suitcase to take my son to the most magical place on earth. My sister-in-law kept our new daughter so we could give our first born our undivided attention once again in his life. We were only gone a few days, but it was enough to cure my spring fever and cure my travel bug sickness. Well, the itch is back! I have the bug badly. I’m itching terribly to go somewhere. I’m not joking when I say I subscribe to about twenty different travel and leisure e-mail subscriptions. While most moms probably subscribe to e-mails to tell them how to educate their children, my inbox is always alerting me to the latest travel news, the newest resorts, and best luxurious travel deals and offers out there if there is such a thing. I can't even keep up with them, but when I get a moment, I read every e-mail. Last week, my symptoms went into overdrive when I got an e-mail and photo from the Biltmore Estate in Asheville talking about spending Easter weekend in the mountains. I'm not kidding when I tell you that this travel bug attacked me with all its might. Biltmore hosts an egg hunt with a visit from the Easter bunny on the front lawn of the estate. Antler Hill Farm, which is a great place for children to visit on the estate because of the live animals, will host bluegrass music all afternoon, and the winery will have a children’s grape stomp. Really? 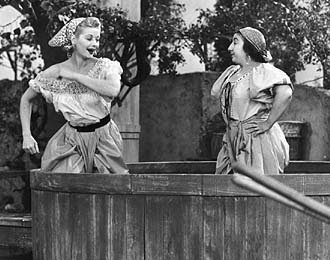 I had thoughts of stomping into the grapes myself and doing my best “I Love Lucy” impersonation. It may sound silly, but I had to cut off the computer because the travel itch was taking over my mind and body, and logging off was the only way to relieve my symptoms. We are now dealing with after storm clean-up so it is fruitless for me to obsess over going to Asheville this year, but it really got me to thinking about future years when the bug strikes again. I think it would be fun to start a new family tradition where we spend Easter on the road enjoying new experiences and creating family memories. But for now, we’ll have to make our memories in our home. And to quote my husband on something he says every time the travel bugs bites me, "Being home doesn’t cost us a thing." Contents of this post originally appeared in my blog column for the News and Observer Triangle Mom2Mom parenting site on Sunday, April 17, 2011.